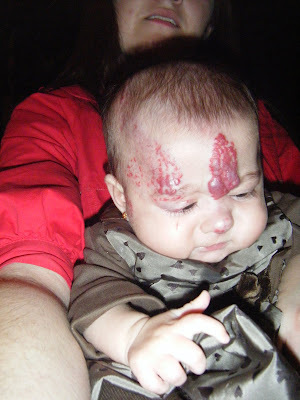 well i thought it would be good to add this little post cuz if someone is interested in cherry hemangiomas and they look for it on Google i guess this could be useful... first i have this little cousin who was born perfect! but a few days passed and she started getting this little red spots on her forehead, nose, and as the time kept passing by they started getting big and really red... i got really scared cuz they looked so big! and painful! 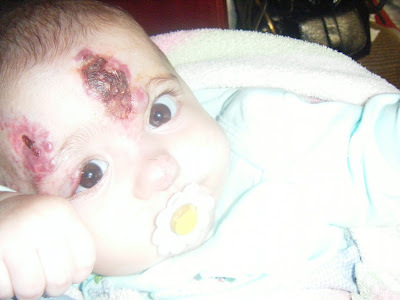 so i started researching and found that they were called cherry hemangiomas and that they are common in baby's that are pale and girls... and born prematurely, which matched my cousin, and checking the treatments and we really didn't knew what to do... then she started having one on her eyelid, and checked back on the Internet and found that it could get really big till she couldn't see... and considering her age (only 6 months old) and how fast it was growing her mom decided that she would go for cryosurgery and got everything done in the same week i researched. I was scared cuz she was so small to get a surgery knowing that she could die cuz of the anesthetic. when she got out of surgery they told us that she may need a second one cuz it was big and she had several of them... and she got the second one which was more painful but she was older (hahaha just 9 months old). now she is almost a year old and her scars are fading... shes now perfect, painless hahaha.